Keeping up with Bedrock fashion is no small feat, but Wilma has a little secret weapon in her arsenal of style tricks. Zebra print. She's been hanging on to this one for just the right occasion to really knock Fred off his feet. Of course, she could always just whack him with a club, but why go to all the trouble when she can just knock him out by looking amazing? Wilma has always been the real star of the Flintstones family. We think Fred is cool and all with his human-powered car and sweet lodge hat, but Wilma is the one who truly has style and personality that’s ready for the small (and big) screen. She is, after all, the one holding the family together - right? Fred’s shenanigans can only go so far before Wilma has to swoop in and save the day. Now you, too, can have the same style and class as the first woman of Bedrock, Wilma Flintstone. This affordable and officially licensed Wilma Flintstone costume will have you ready for Halloween or just a fun night on the town. 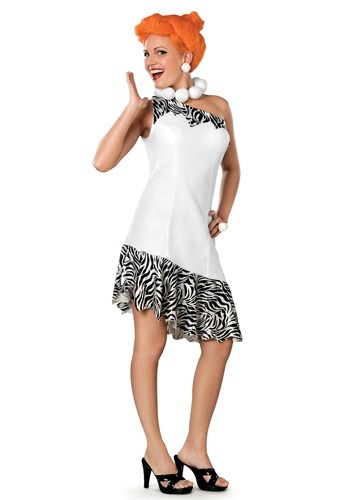 The one shoulder white fleece and zebra print dress is ready for any occasion. The zebra print has a velour fabric at the hemline and neckline. The costume also comes with a plastic necklace of large rock shaped ‘pearls’ and you can top it all off with the included orange wig with Wilma’s signature style. Add a pair of caveman feet for a look that’s ready for the Stone Age!